Sometimes as people look back on the way things used to be they are called the “Good Ol’ Days”. We tend to look back and say how much rosier and better life was in some previous time. We think that things were simpler and happier then. I am one of those people who tends to look back and forget all the bumps in the road. I forget that there have been and always will be bumps in the road as long as we walk this sod with mortal flesh. Today I will share a story about a small bump in the road. I share this to also remind myself that there were bumps along the road here as well. This morning I needed to get the kids downtown for an appointment. In my attempt to be frugal I decided we would leave early and walk down rather than spend bus fare to ride down. The kids grabbed their scooters and I laced up my hiking boots. We set out on our walk to the city centre. About halfway there I noted that the kids were laughing and having a grand time so my efforts to walk the whole way were going well. Even though it was a bit overcast and chilly everyone was happy. Then scene two….. enter the bump in the road. The footpaths here in Durham are generally quite nice, but as you travel a mile or more you begin to notice differences along the way. Some parts are smooth with newly laid asphalt. 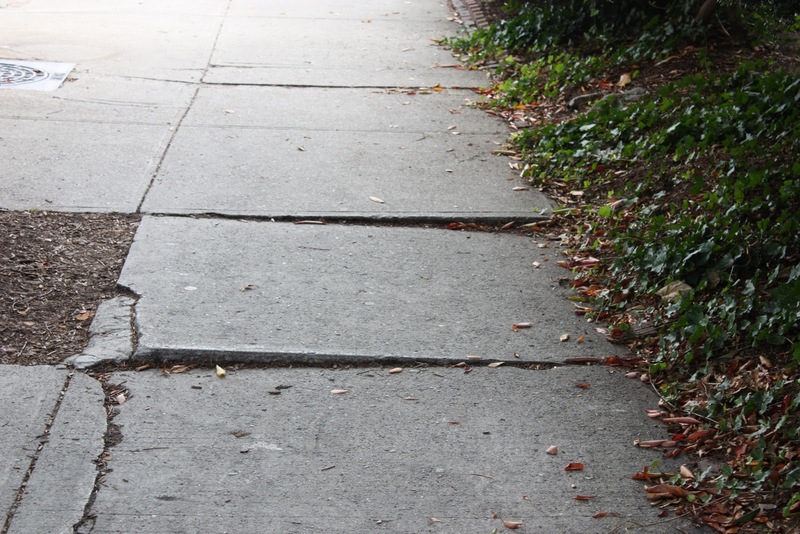 Other footpaths are older constructed of large concrete slabs. Still older footpaths are constructed of local cobblestones. Meg hit one of those uneven sections of concrete slab and her scooter wheel stopped however she did not. She hit the pavement quite hard skinning both palms, not too badly but enough to ruin our walk. She needed a couple of plasters (bandaids). I was not much of a supermom today and failed to pack my MacGyver like teeny tiny first aid kit. I had nothing. Thankfully there was a Mom and Pop type corner grocery store that I was able to whisk in to a purchase a few things to make repairs to Meg’s hands. As I handed over the money at the till (register) I noticed that my total was almost the exact amount that I had saved on bus fare by walking in the first place. The best laid plans…..
All of us face bumps in the road. Some of my friends are battling cancer. Still others are facing end of life decisions with older parents. Families lose jobs or houses. Some bumps are small and quite easily forgotten like Meg’s bump in the road. She will remember the great times that she had here walking and riding her scooter everywhere. She will probably grow up and still look back at this year in England as the “good ol’ days”. As we face bumps in the road of life let us take heart and know that we need not face them alone. John 16:33 gives comfort in the bumpy times, Jesus says, “I have told you these things, so that in me you may have peace. In this world you will have trouble. But take heart! I have overcome the world.” Come to Him with your wounded hearts, your scraped up palms. He will provide comfort that is better than any plaster. He will set your heart at peace in the midst of any trial. There will still be bumps in the road but we don’t need to face them alone.